Fourteen years ago it was an idea: journalism by the people for the people, democratically organized. Not for the advertisers, not for the corporate shareholders. This idea launched as The Dominion, followed by the establishment of the Media Co-op. It’s a concept that still holds promise, but at this moment we need to look to the past to build for the future. When The Dominion launched, Facebook and Twitter were non-existent, and Google AdWords was just beginning its ascent. 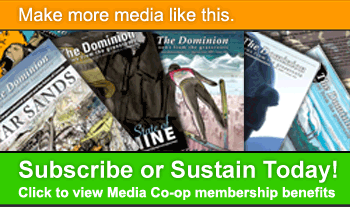 Over the course of fourteen years, ninety-six stellar issues of the The Dominion (published by the Media Co-op) were produced, challenging mainstream narratives about everything from the tar sands to Canada's role in Haiti, and thousands of articles were published on Media Co-op websites—delivering, as the motto promised, "news from the grassroots". In 2014, stories were being fact-checked, and the quality of the journalism was as high as it had ever been -- better researched and fact-checked than that of many corporate media outlets. But there were signs of strain in the organization. The founders who had put in so much voluntary and underpaid labour for years were stepping away, and tensions were running high between the city-based chapter operations and the national (Montreal-based) operations. The Media Co-op annual general meeting of 2014 was a tense affair. The direction of organization coming out of that meeting was unclear, and enormous expectations were placed on under-resourced staff. 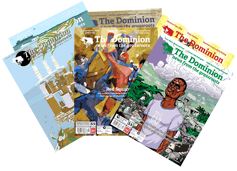 Still, in 2015 a solid issue of The Dominion was produced, 4 More Years of Austerity?, and in 2016 an incredible piece of work, The Dominion Special Issue on Indigenous Land Defence, Warrior Up!, was published. At the same time, important stories continued to be published on Media Co-op websites, though at a slower pace than before. But by summer 2016, the organization was thousands of dollars in debt. Both staff members had to be laid off, volunteer editors were becoming less active, and the board of directors had limited capacity to take on governance and administrative duties. 1. The website is glitchy and out of date. 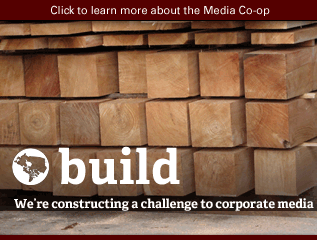 The Media Co-op site needs work. Some updates have been made to the back-end, but the design that readers and contributors use needs a revamp. 2. The chapter model needs repair. The four chapters of Halifax, Montreal, Toronto and Vancouver, which thrived for several years and produced amazing coverage (eg. G20 in Toronto, resistance to Vancouver 2010 Olympics, Quebec student movement 2012, Elsipogtog anti-fracking protests in 2013, etc.) are now all but defunct. It is unclear whether any city has an "active" chapter in an official sense. 3. Editorial capacity is too small, and processes may be outdated. At one time, there were many active editors on the site, providing conceptual feedback on stories as well as working on copy-edits and fact-checking. This enabled anyone to post anything they wanted — a bold concept — and for there to be a team of editors sorting through the content, featuring the solid works and leaving other posts unfeatured (though still available to be read). Today, there are very few active editors on the site, which is obviously a problem for any media outlet, especially for one with such an open and involved editorial process. In the current situation, there is not much content being produced, edited and featured. The Media Co-op can do better. To do so, more capacity (ie. people) will be required, along with a look at whether the current processes are working. 4. The member model needs an update. 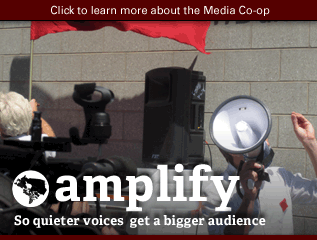 Democratic participation in the Media Co-op's decision-making has been a defining feature of the organization since its founding. Being a cooperative is a core feature of the Media Co-op differentiating it from other outlets, which are often controlled top-down in a standard corporate structure. 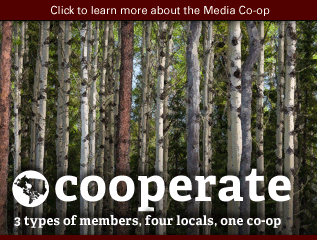 Membership categories and guidelines at the Media Co-op functioned well at times in the past when more people were more active in the Co-op. But now, with fewer people involved and fewer people identifying strongly with a specific membership category (ie. reader, editor, contributor), it may be time for discussions to update the membership structure. 5. Revenue streams have dried up. With the slow-down in activity, and in fundraising, fewer people are giving to the Media Co-op, and fewer organizations are making donations or buying ad space. This creates a downward spiral where less support means less activity is possible, which in turn draws in less support, and so on. 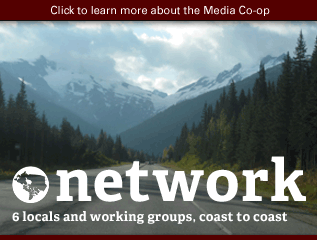 Unless these five problems (and likely others) are addressed, the Media Co-op will struggle to re-establish itself in Canada's media landscape. 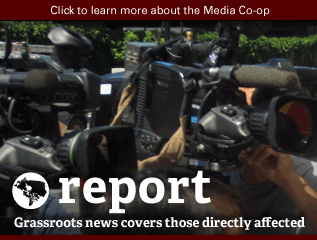 The Media Co-op has been instrumental in bringing forward news and analysis of Canada's abhorrent treatment of Indigenous peoples when no one would listen, in exposing Canada's mining crimes around the world, and shining lights on many other under-reported issues. 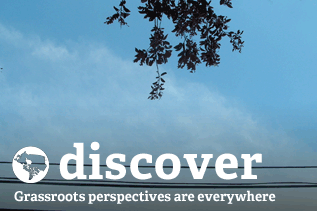 At the same time, the Co-op has connected grassroots voices from around the country and around the world. With renewed energy and focus, this work can continue, and you can be part of it. 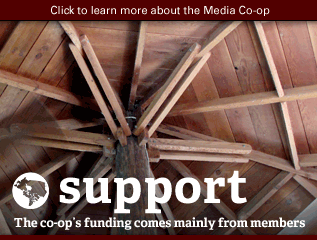 A potential reboot of the Co-op gives space to ask: what is the role of the Media Co-op today? The media landscape has changed, as has the political climate. For example, Indigenous issues have gone from being ignored, to the word 'reconciliation' being used everyday in major media. How, today, can the Media Co-op work to show the emptiness of most reconciliation rhetoric and lift up marginalized voices? To work through questions like this, new people power is needed. 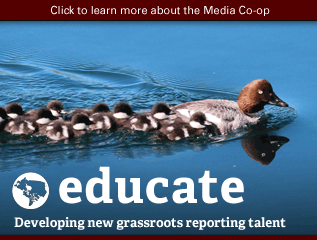 The administrative and governance aspects of running a national media cooperative also require increased capacity, which can come from people keen on learning and leading on these aspects of the Co-op.